Take the strawberries and mash them in with half the sugar (ie. 2oz or 50g) in a bowl. Place in the refrigerator whilst making the rest of the recipe. 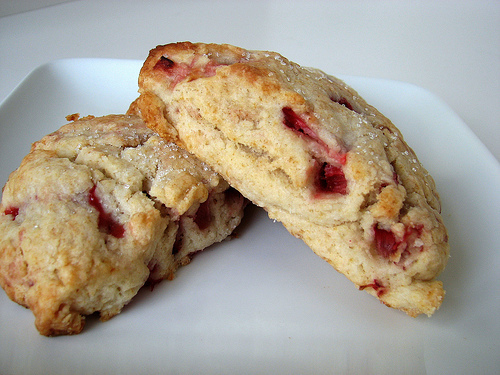 If you love scones why not dress them up with some strawberries! Go onnnnn next time you are baking scones be adventurous and bake them with strawberries! About 2 handfuls of strawberries – I used about 10 medium sized ones – sliced. Rub the flour (with the baking and bread soda added in) and the butter together until they resemble coarse breadcrumbs. You can give them a blitz in a food processor either, just don’t overdo it. Mix in the sugar and give it a stir so that its evenly throughout the mixture. Add the sliced strawberries and stir. Make a well in the middle and add your liquid, leaving about a tablespoon of it left. Mix it until it’s all combined. Turn out onto a well floured surface and knead lightly. Divide into halves, shape each half into a disc about an inch thick and cut into 8-10 wedges each. Place on your prepared tray, brush each one with a little of the leftover milk (which you can mix with an egg if you want really shiny scones) and bake in the preheated oven for about 15 minutes or until golden on top! 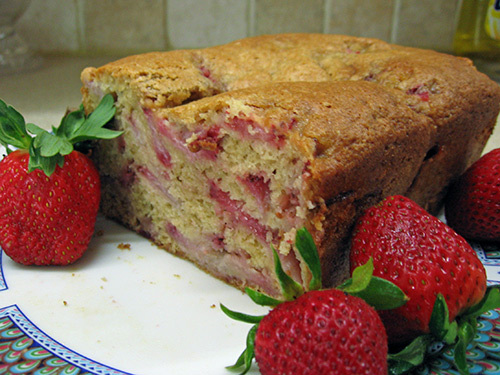 Serve with clotted cream and an optional spoon of jam. Preheat the oven to 350° F. Spray a 9- x-5- x 3-inch loaf pan with butter flavored cooking spray and dust with flour. Tap out excess. 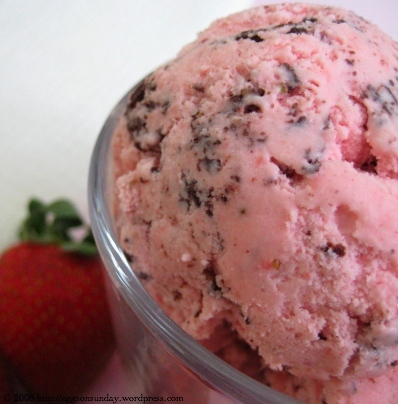 The strawberry is not strictly a fruit! 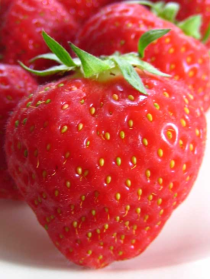 A strawberry is an enlarged stem-end that is made up of lots of tiny fruits called achenes. The tiny, green, dried achenes of the strawberry are what most people think of as the strawberry seeds. They are dotted all over the strawberry, and the seeds of the plant are actually inside these achenes. Look at the picture below. How many achenes can you count? Would you have guessed that a cup of strawberries actually has more vitamin C than an orange? They are also very rich in potassium and folic acid. Overall, a very healthy berry!